The Central Avenue in Harbin, the capital of Northeast China's Heilongjiang Province , has been the city's most prosperous commercial hub for over one hundred years. Built in 1898, the Central Avenue is dubbed as "a gallery of European architectural art." 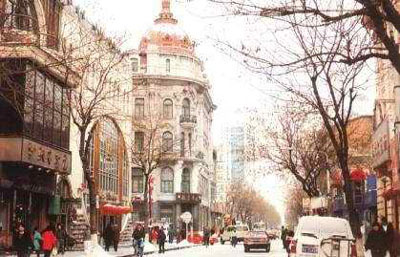 The street, lined with a large number of Western architecture, is a must-see in Harbin. People who have never visited Moscow, Paris or Rome can gain a feeling and appreciation for the architecture of those cities by visiting the Central Avenue in Harbin. Central Avenue is 1,400 meters long and 11 meters wide, stretching from north to south. It starts from the Memorial Tower of Fighting against the Floods of the Songhua River in the north and ends at Xinyang Square. On both sides of the avenue are nearly 200 stores and restaurants, forming a mature commercial service center. In recent years, the stores have been refurbished outside, and have been decorated with lanterns and colored streamers. The transformation has made Central Avenue all the more magnificent. 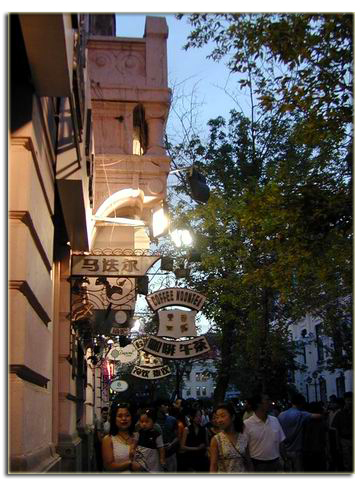 Many commodities from the rest of the world are available in the stores that lined the Central Avenue, Harbin's most exotic street. The commodities include furs from Russia, woolen cloths from Britain, perfume from France, medicine from Germany, cotton cloths from Japan, oil from the United States, clocks and watches from Switzerland, granulated sugar from Java, gunny bags from India, and dry and fresh fruits from various countries. The street was nothing short of an international commodity fair. The avenue, heavily influenced by the West, has its unique history. In 1898, a great number of workers from neighboring provinces poured into Harbin to start the large-scale construction of the city and its railway system. Originally, the area was an ancient watercourse with desolate and low-lying grassy marshlands. On the muddy marshlands Central Avenue eventually came into being because carts repeatedly transported equipments for constructing railways here. By 1900, the street, also called China Street, took shape. At each crossing, a wooden bridge was built for pedestrians to cross the street. When it was fine, vehicles usually stirred up a cloud of dust along the street; when it was rainy, the street was quite muddy.